Falcon with proc. 060 required. Fast paced with many kind of scenes and a globally structured design. 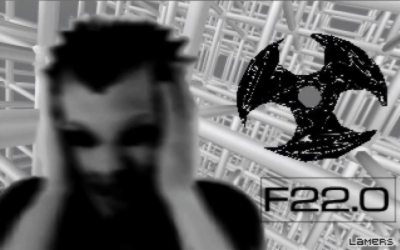 Neat Falcon demo fast paced with great music and i guess F22.0 is a diagnosis code for something like Paranoia or Borderline ? Cool, one of the highlights of the party ! It makes me wonder to what extend this is possible on the 030! Good, fast paced stuff. Cool tune, quick changes. Well done guyz! solid falcon 3d demo tho, looks very polish(ed). Nice, superfluid 3d. Some really cool scenes. MKM - I can see you've added a lot of new features to the engine! Looks really coherently design wise. Looking forward to your next productions. It's about time to fill this TBL void on 680x0 :). Agree with wysiwtf on this one! niiiiiiiiiceeeeeee! great stuff guys ! This one rocked the party, thx for the show ! Totally awesome demo. Unique style, design, fantastic music (wow, VLX! this is _REALLY_ excellent moody track!). Guys... this demo is MAGIC! A very good falcon 060 demo. I like it. Well done guys. Excellent demo with cool msx. Very cool progress MKM! Congratulations, and I'm looking forward for next your demo on Falcon from LAMERS! Quite an achievement! Great work! Thanks! OOOoohhhh !! YES ! Lamers striked again with a very very good production ! Design as usual when Lamers are in the place. YOU Guys really rocks ! Familiar nonclemanture. Fitting colorcheme. Framerates and sync - and for the Falcon060 - yay! Thank you for this. Keep 'em coming! Only ATARI makes it possible - FIGHT the WINDOWS PC CANCER LAMERS!!!! Could easily have been the winner, but ultimately this one has the weaker tune. Very intense and dynamic prod with innovative 3D scenes, some of the best the 060 Falcon has to offer. In contrary to previous posters I think the camera shakes work very well with that kind of music and effects, e.g. in the spikyball or the funky inball scene. The insanity 3D part object design is awesome and made me scratch my head. I also really like the greetings and cube grid flyby part. I am not a big fan of the "blood on random font" picture layers tough, the layering in general looks a bit static, maybe a sort of blending for dis-/appearance of the graphics could help. Most amazing part for me: the crow approaching and morphing on the fence. Great 060 demo! Havoc: right, this was my association, the red blobs could be anything (blood, barszcz or just red;). As a detail, there is also something red visible on the floor in the caterpillar part btw, which makes this part even more spectacular. quite a few "wow" moments when watching this!